Type the following text into the address bar of your browser. Voila, a text editor inside your browser. Thanks to Jose Jesus Perez Aguiaga and the commenters. There may even be better suggestions in the comments later on. Why do I think this? I have created some new sites in the last two weeks, some of which I have not publicised or linked to on Facebook. Very soon after publishing new pages, the site has stats from what looks like a facebook crawler on the site. Very interesting. It seems to be much more active in crawling the site than Microsoft or Google. This would suggest that they are collecting their own map of the internet outside of links that are posted within Facebook. What else could it mean than building data for a generic web search engine? Haven’t really seen anyone else mention this so far. I was just thinking about how it has been so long since I have heard a new album from the people around Nuspirit Helsinki and the Five Corners Quintet that I did a search on youtube. I found the above piece which sounds great. I’ll be looking to buy that album on my next music buying spree. Saw this cool Tumblr blog called Actual Facebook Graph Searches about actual Facebook graph searches. I don’t have access to the search yet but the searches done on this site are very interesting. The first page contains clarification about the searches that were already done. How interesting the search is for you depends on the information within your own network. The main point is that it makes sense to clear up posts, likes and privacy settings in Facebook. This is test of a WordPress plugin showing group photos. It would be nice to have it working for the dooagh.com website. This is a feedback form test. 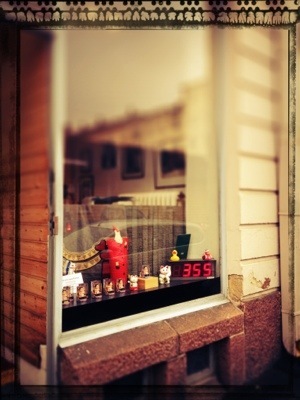 Santa’s Helsinki office counting the nights….